Running out of ways to eat rice? Eating rice everyday isn't for everyone. That's a fact! For those ready to take a quantum leap into the Japanese diet, here's how! 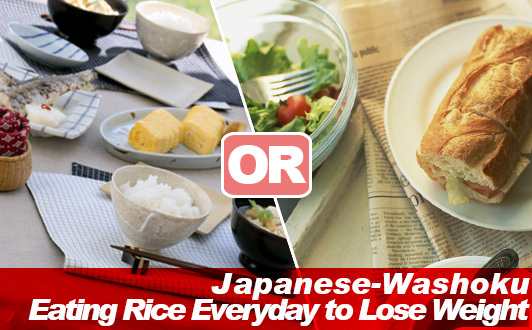 Although there is more to the Japanese diet for weight loss than eating rice to lose weight, it doesn't help to compare different staple foods to see what you are up against. In this case that staple food is bread. Most people think the Japanese diet is eating rice everyday, but in fact people in Japan eat just as much bread. Ask anyone who has ever been to a convenience store (or Combini as they are called in Japan) about what is primarily sold. Bread, bread, and even more bread. What everyone wants to find out is does eating rice make you fat in order to consider whether it's the right choice to be making in your diet to try to lose weight eating rice. Just as any other diet turns the wrong corner when things begin to get out of proportion eating too much rice will still make you fat. If you are concerned whether are not you are eating too much rice start eating rice with chopsticks. That should help keep you busy while allowing you to get the chews you need to satisfy your appetite eating less. Is eating rice healthy is a figure of speech. If healthy is taken in the case that eating rice on a diet may help- you lose weight when coming from a less balanced diet, yes! - One of the health benefits of eating rice that people love is the fact that it's low-gi, which is great for people who have to watch their blood sugar. The disadvantage of eating rice for most westerners is not being familiar with how to actually go about eating rice every day without running out of fresh ideas that make you look forward to eating healthy on a rice diet. The Japanese have a word for it and that word is Okazu, which can be translated into side dish. Washoku (or Japanese style meals) can easily be thought as contains three things: rice, okazu, and miso soup. Note that we will not be getting into Ocha (teas) and other drinks at this point. How it works is that you rotate between eating these three things. An okazu can be anything that can be used in food combining to complement the texture of cooked white rice such as a stir fry, nori seaweed, or eggs eaten at breakfast that most Japanese people like to eat with soy sauce. Notice how I haven't started to talk about miso soup yet. That's because miso soup is in fact special. There is actually a divide between people who think that miso soup should be treated the same as an okazu that is just something you eat with rice. In reality, it is more than just something you can eat with rice. It's miso soup! With the Japanese population holding records in average longevity and record low rates of obesity, who is to say that eating rice everyday is bad? If eating rice makes you fat, then surely the statement about low obesity rates in Japan would be false. Does eating rice versus bread help you reduce calories? A bowl of rice is said to contain 150g of rice, which come 252kcal intake of calories. Compared to a loaf of bread containing 6 slices each 67g (which is the most common standard for packaged bread in Japan), a slice of break comes to 177 calories, whereas a loaf of bread cut into 8 evenly sized slices (50g) this amount is 132 calories. When comparing rice with bread in terms of calories, rice is in fact higher in calories than bread. This sort of intake of calories is what may lead many people to believe that eating rice will make you fat. However, when the intake of calories of bread is taken along with the calories in condiments such as butter, margarine, and jams the calories associated with eating bread is much higher than you would like to believe. Adding butter, margarine, or jam to a slice of bread adds 37.5kcal (5g) and 40kcal (20g), respectfully with the latter being the calories in jam. Let's take a brief look at the calories you get eating side dishes comparing Washoku with Yoshoku (western style meals). Washoku side dishes are way low in calories. Bread on the other hand may involve adding a sausage or a piece of bacon or butter on an omelet. In either case that is going to be high calories. Low calorie Washoku contains foods that help cut back on fat in your diet such as vegetable and mushrooms. The type of bread you decide to take into your diet drastically changes the landscape of what amount of calories you should expect to be looking at when planning your meals. Although a loaf of bread such as wheat or even white bread may be low in calories and fat. On the other hand, a croissant is said to contain between 150 and 200 calories. Even the modest butter roll will run you up to 100 calories. Going into the high calorie division of different type of bread, the list goes on with pastry bread somewhere between 300 and 500 calories a pop! - Case and point, not all types of bread are created equal when it comes to calories and fat content. We looked at how thee calories in rice and bread differ depending on how they are applied in food combining. Rice as a staple becomes a problem of balancing the right Washoku okazu to cut back in calories while getting the nutrition value you need for a balanced diet. Bread as a staple food in addition to how to apply food combining includes different types of bread with varied amounts of calories across the board making balancing your diet an equation requiring that you look into multiple variable looking for the solution that works best for you. Eating bread while on a diet comes with areas you should watch out for in order to keep it low calories. Keep in mind how much calories you are adding to your meal with side dishes. That means not just using any old dressing in your salad. Note that the type of bread you eat changes how much bread calories you are putting in your body. In general, whole grain bread contains few calories than other types of bread and lastly, it is easy to not chew your food completely when eating bread due to the fact that you tend to forget that you area eating bread when the surge of flavor from the condiment you are using hits your mouth. Always remember, it's just bread. Don't let your appetite get the best of you.